A teenage girl climbs into her coach’s white Chevy Malibu. The heat lies on the land like the heel of a fat man’s hand. The cicadas scream. The cattle chew the spear grass. The turkey buzzards wheel. The car crunches the gravel leading away from the high school. The coach turns ontoasphalt. They ride that black ribbon in silence. Nothing stops the eye. Nothing bends the road. It’s a blank slate, this land. Anything might be scrawled on it. Metropolises might emerge, as Dallas did 208 miles to the northeast and Houston 292 miles to the southeast. Armadillos or astronauts might arise, oil or bluebonnets, Janis Lyn Joplin or Dwight David Eisenhower. It’s as blank as the page upon which the teenage girl began a poem. THEY’RE DRIVING to the Texas state track meet in Austin. It’s May 2008. She’s the only athlete in her school who qualified. But only two other girls are on her track team. Only 58 other students attend her high school. Only 162 other people live in her town. A school. A Baptist church. A post office. A volunteer fire department. Linda’s Hair Hut. Two water tanks. No stoplight. An hour-and-a-half drive to shop for clothes. How’re your parents doin’? Didn’t see you in church last week. That’s her town. Two hallways. Eight classrooms that double as junior high classrooms, some with old, defunct coal heaters and pipe vents. On the front steps, a pair of muddy boots belonging to Ty Shackelford, an eighth-grader who has killed nearly 400 feral hogs at night by leaping on their backs with his flashlight and knife. That’s her high school. SHE STEPS onto the University of Texas’s Rekortan “energy return” polyurethane-system track. Her track, 111 miles back at Rochelle High, is made of dirt, grass, weeds, rocks, red-ant mounds and ruts from Friday nights when the pickups pull up and fans watch from lawn chairs in the truck beds with their headlights crisscrossing the field as the Hornets play six-man football. 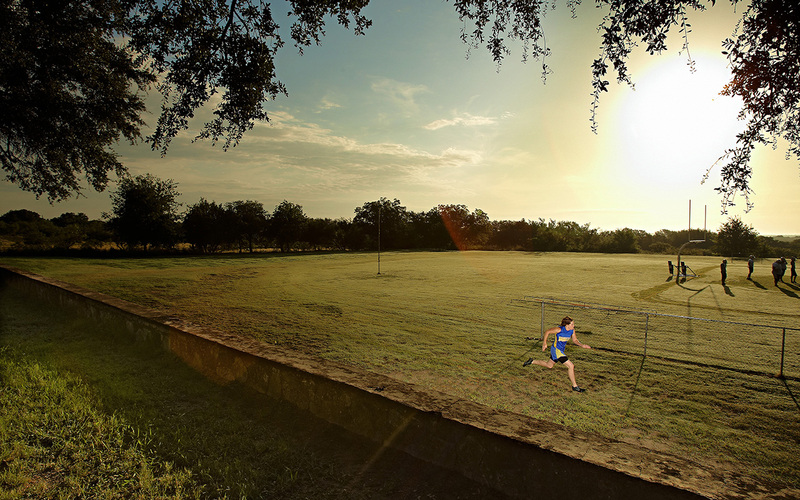 Her track has no lanes or borders, blurs into the football field and has puddles at one end that force her to cut into the end zone, a trench from an old water line that she must hurdle, goats and a llama grazing beside it, armadillos and deer pattering across it. SHE’S THE water boy on the football team. She’s president of the National Honor Society, a year from graduating as valedictorian. She can bench-press 180. She hunts deer with a bow and arrow. Anything might arise from this land. Something that never has in the history of U.S. sports is about to. A freckle-faced ranch girl from the very heart of Texas is going to win the state track team championship.